1 of 3 Beat butter, 1/2 cup of the sugar, yolk, vanilla and salt until fluffy. Add walnuts and flour. Blend on low speed just until combined; dough will be crumbly but moist. Gather dough together with your hands to form a ball. Divide dough in half; wrap in plastic, refrigerate for 1 hour. 2 of 3 Heat oven to 375 degrees F. Line 2 large baking sheets with nonstick foil. Break off 1 tablespoon of dough and roll into a ball. Then, roll ball in remaining 1/2 cup sugar to coat. Place on prepared baking sheet. Press a deep indentation into center of dough, large enough to hold 1/2 teaspoon jam. 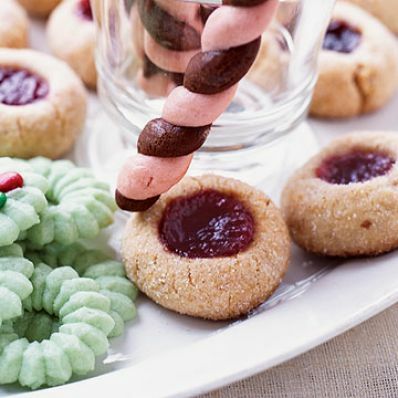 Fill indentation with jam; repeat to form 36 cookies. 3 of 3 Bake cookies at 375 degrees F for 12 to 14 minutes, rotating pans halfway through, until lightly golden. Cool on pans on racks for 5 minutes; use a spatula to transfer cookies to racks to cool completely.